I found today's reflection from St John's Abbey a wonderful reminder of the inclusiveness of God. 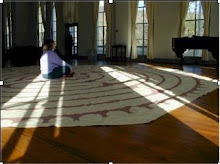 One of the things I treasure about our Abbey is the willingness of our Abbess and those who plan our events to draw spiritual practices from other faith traditions. We have become such a rich community because of this diversity. But we also remember that, as Christians, we show our witness to the world through our belief in Jesus Christ and how Jesus embodies God's unflinching love for each of us. The challenge is to continue to be open to seeing God's love in action in the world around us and in spiritual practices of other faith traditions while remaining grounded in who we are as Christians.